The Roomba and Pokemon Go. 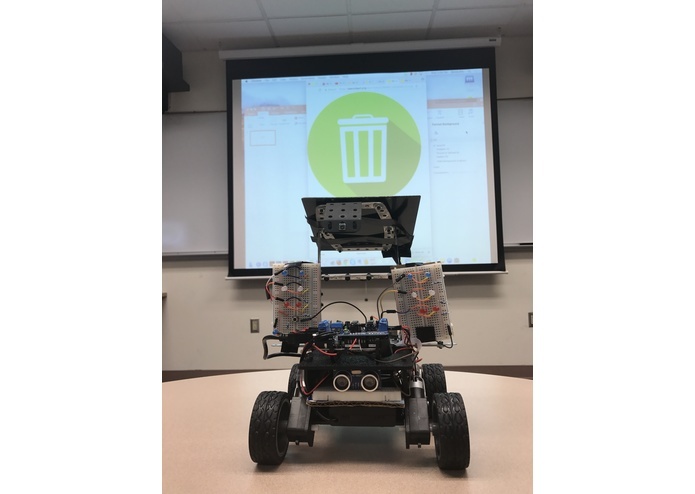 We wanted to combine the idea of an autonomous robot that collects trash (humans are better for this) and the fun of an augmented reality game to utilize gamification strategies in a socially beneficial manner. There are 2 main components to this project. Service Bots, the autonomous, trash seeking robots, and the mobile application. Service bots roam around looking for objects that have similar physical attributes to trash (objects that are typically low to the ground). 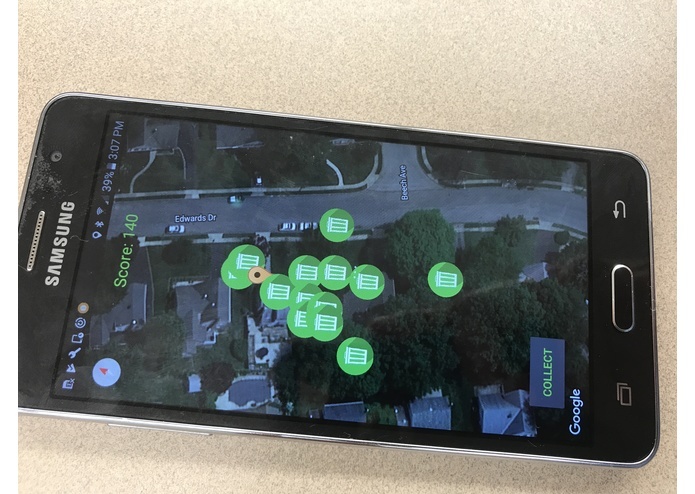 Once a service bot detects an object, it drops a pin to the google maps activity in the application at the coordinates specified on the communicator android phone which is on the bot. 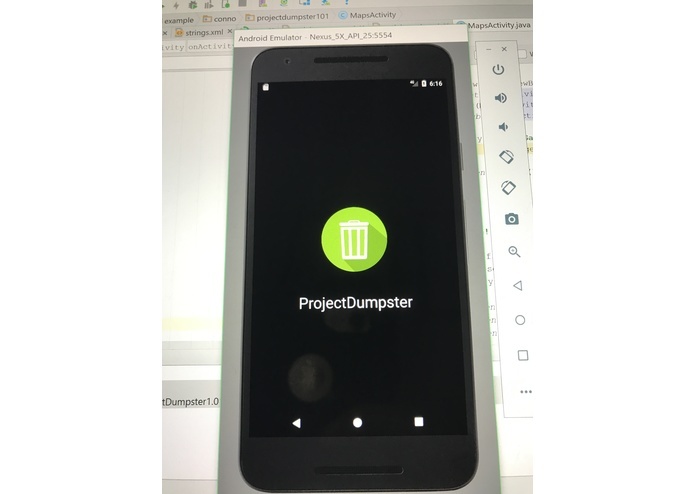 It is up to the user to look for this trash to redeem points, the user must take a picture of the object while in the app which then sends the image to the Google Cloud Vision API, which returns probabilities of the object in the image being some other image. The application is looking for high similarity hits of certain objects that we have predefined to be trash (water bottle, glass bottle, etc). If the user's image has high likelihood of being trash, the user will be credited. I, Sean Connolly, a Computer Science major from Northeastern University, and my friend from high school, Conor Boston, an Aerospace Engineering major from Pennsylvania State University teamed up to take on this project. This is our first time working with an Arduino (definitely not our last), there was a hefty learning curve for both of us. 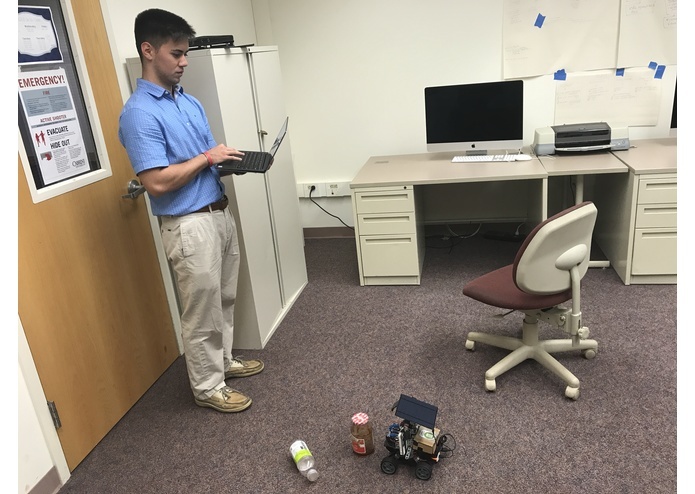 Conor handled the electronics and hardware components of the project: Arduino 101, Uno, Motorshield, Ultrasonic Sensor, Solar Panel and external power supplies. Conor has had experience working with robots in the past, this is why I recruited him to the Project. I worked on building the software for the Android application and both of the Arduinos. I had built android apps before this project, but mostly simple tic tac toe games or soundboard apps. So an augmented reality game was significantly more challenging, and rewarding. Also the allure of learning a thing or two about hardware was very appealing. As mentioned before, the learning curve was the challenge. 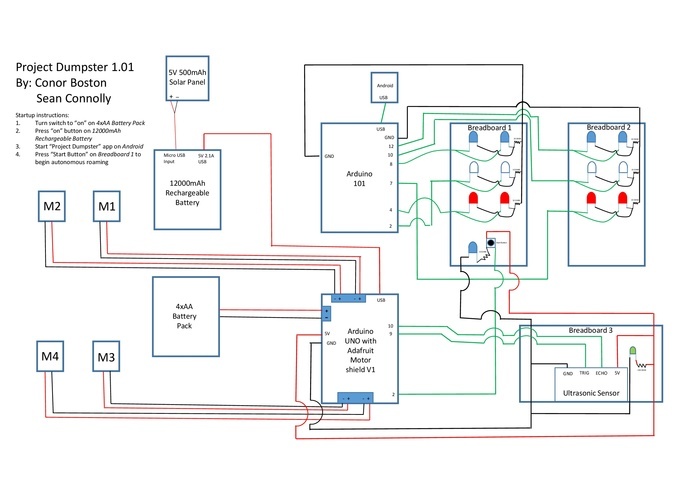 Coming from no experience with Arduinos or micro-controllers, it was very intimidating at first to begin, however, online resources and ease of use of the Arduinos on board capabilities such as the accelerator, made this manageable for us. We're proud of each other for coming in clutch when the situation called for it, putting in the time to get the project completed, working through the frustrating problems and bugs that naturally arise in projects like this. Also, we challenged ourselves with this project, there is pride in knowing that we put ourselves outside of our own comfort zones for this project. We both gained experience working between our disciplines, software and hardware. The Rewards System and an online competitive mode. Collecting trash for points, competing with friends will be fun, but the whole idea of this project is that playing the game returns tangible benefits (currently just reducing litter). But in the spirit of tangible rewards and encouragement for playing this beneficent game, Project Dumpster seeks to partner with socially conscious companies that would like to provide special discounts in exchange for collecting large amounts of trash. 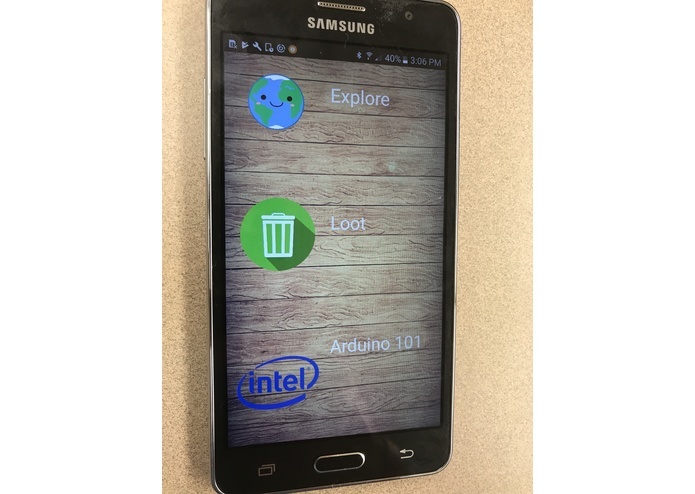 I coded the Android Application, Arduino 101, and UNO. I designed and built the rover's hardware, connecting the micro-controllers, batteries, breadboards, LEDs, android phone, solar panel, etc. I directed the video piece to go along with Project Dumpster 1.01 and edited it together using Final Cut Pro.